Palm Beach is a place that holds a special place in my heart. I've been visiting for years, and there is something magical about the endless stretches of beach, Europe-esque downtown, and quirky vintage & antique shops that line the Dixie highway. Look no further for your next warm-weather weekend escape. There are many beautiful and grand hotels around Palm Beach, but my all time favorite is The Colony. The Colony is steps away from the beach and is walking distance to many of Palm Beach's best restaurants and shops. Besides, its convenient location; I love the Colony's soulful and vibrant decor. There is no shortage of things to do in Palm Beach. Spend the day relaxing on the beach, shop till you drop, brush up on your history, or even book a much-needed spa day. There is so much to love about Palm Beach, but my absolute favorite thing to do is spend time on the beach. Palm Beach does not get incredibly crowded which makes it a great place to swim, paddle board, or walk on the beach. The lifeguarded stretch of the beach tends to be busy, but you can walk for miles after the lifeguarded area and see only a handful of other people. Shopping in Palm Beach covers the entire spectrum. There is everything from high-end boutiques to resale shops. There are a few different shopping areas around Palm Beach. My favorites are Worth Avenue, The Royal Poinciana Plaza, and Antique Row along Dixie Highway. There are endless great options, but for clothes, my favorites are CJ LAING, Island Company, Skinny Dip, and Palm Beach Vintage. CJ LAING is my go-to for finding funky bags, printed dresses, and one of a kind jewelry. Island company makes the perfect lightweight shirt dresses and is a Palm Beach-based company. Skinny Dip is excellent for cool accessories like basket bags. And last, but not least Palm Beach Vintage is my favorite for finding designer vintage clothes. Their selection of dresses is incredible, and I always see something that I love. For home goods and gifts check out Aerin, Kassatly's, and the Church Mouse. Aerin sells the most beautiful home baubles - my favorites are their picture frames and game sets. 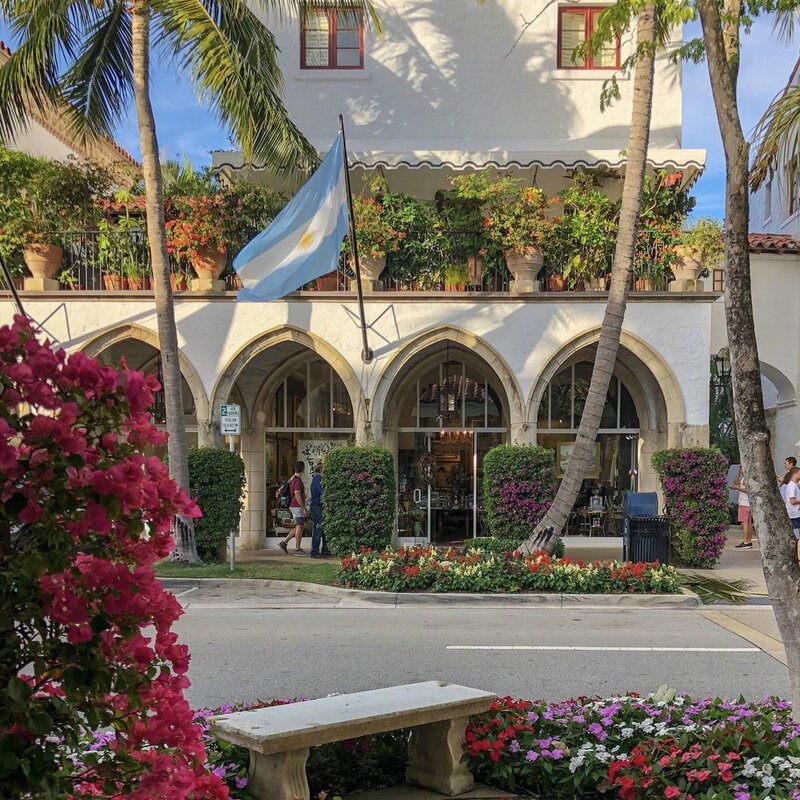 Kassatly's is a Palm Beach icon. This linen store sells gorgeous, and one of a kind embroidered pieces. I love their towels with lemons embroidered on them. If you are looking to find a bargain head to the Church Mouse, this resale shop sells everything from fine china, to furniture to clothes. Palm Beach is full of history. Many artists, politicians, world leaders, and business tycoons have passed through here. One of the most notable is Henry Flagler, Standard Oil Partner. Flagler is often considered the founder of Palm Beach and built up much of the area. His grand Gilded Age home, Whitehall, is now a museum. Another interesting cultural site is the Society of the Four Arts. The Society of the Four Arts puts on concerts, art exhibitions, and has a beautiful botanical garden. I went to a great exhibit here that featured paintings created by Winston Churchill. If you are looking to experience more art, I recommend checking out the galleries on Worth Avenue and visiting the Norton Museum in West Palm Beach. The Norton recently underwent a significant expansion. One place that I always stop at in Palm Beach is Anushka Spa & Salon. I've been to a couple of spas in Palm Beach, and Anushka is by far my favorite because their pricing is reasonable and I never feel like I'm pushed into purchasing products or services. My go-to treatment is the signature facial with Uslin (she is a skincare genius). My skin looks great for months after a visit with Uslin. I've gone to Anushka for hair cuts/blowouts, nail appointments, peels, and massages and have always had a great experience. Palm Beach has many great dining options. The restaurants are always packed, so I recommend booking reservations in advance. Craving Cuban food? Head to Havana for the best Cuban (in my opinion) around Palm Beach. The servings here are HUGE, so I recommend splitting an entree and appetizer. My favorite dishes are the Tamal Cubano, Maduros (fried plantains), Arroz Moro (white rice mixed with black beans), Arroz con Pollo, and Lechon Asado con Cebolla. All you have to know about Flanigan's is to order the ribs. Flanigan's is a Florida chain known for their ribs and has become a staple in my Palm Beach diet. My go-to order is a half slab, baked potato (extra butter), and coleslaw. Bricktops is one of my sister Emily's favorite spots. They serve American food, and you can't go wrong with anything on the menu. Cafe Boulud serves excellent French food and has plenty of seating. I recommend checking out their prix fixe menu options online (they always have a brunch or dinner deal going on). When you call to make a reservation request to sit outside in the courtyard. Tulipan is a bakery located in West Palm Beach. My favorite thing to get from here is their coconut macaroons dipped in chocolate. HMF is a bar located in the Breakers Hotel. The Breakers has an incredible property that's well worth exploring. I recommend grabbing a post-dinner drink at HMF and checking out the hotel. Pro tip - get your parking ticket validated by the bar if you drove to get your parking comped. La Cuchara is a restaurant with a lively bar scene at night. If you're looking to 'go out' in Palm Beach stop here after 11. Another popular night spot is Bradley's. Bradley's is located off of Clematis street and has a ton of outdoor space. Downtown Palm Beach is walkable and Uber is available. If you plan on going to a lot of areas outside of Palm Beach I recommend getting a rental car, but you do not need one to get around Palm Beach island. What are your favorite things to do in Palm Beach?